our evening temperatures are cooler now, after a long, hot, dry summer here in Kentucky. We will enjoy our roses while we can. This pretty vintage rose pattern teacup is a New Hall, an English Bone China, made in Staffordshire. 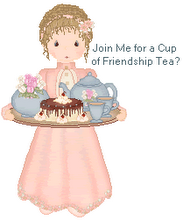 Visit Miss Spenser's Blog for Teacup Thursday links. Very pretty, Linda. I have a similar teacup...at least similar-looking roses. It's Royal Patrician and a different shape, though. But the gorgeous roses look nearly identical. I LOVE ROSES!! I love this pattern print too..it was one of the first rose teacups I have - mine is Royal Patrician. Love roses and your cup displays them beautifully. Enjoy your roses in the garden on the beautiful autumn days. Your rose pattern Hall teacup is lovely. I like the ridged texture, as well as the pretty roses. Roses and teacups are a great combination !